In October 2016, fruit and vegetable exporter Exportadora Cruz Bautista found itself in a troublesome situation. The U.S. Food and Drug Administration detected salmonella in a shipment of hot peppers on their way the United States from the Dominican Republic. The presence of the bacteria landed the exporter on the “automatic detention” list, which means that every single one of their shipments will be detained and inspected. The resulting delays reduce shelf life before the produce even arrives on grocery store shelves, not to mention the harm done to reputation. 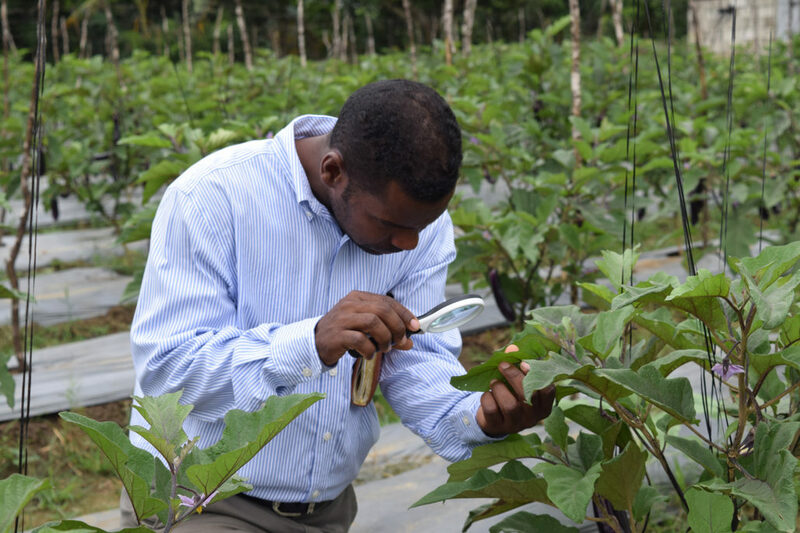 José Oneydo carefully inspects his crops in Dominican Republic. Given the danger of contamination for both U.S. and Dominican consumers and the impact on the Dominican economy, the USDA-funded program, Exporta Calidad(“Exporting Quality”), teamed with the Dominican Ministry of Agriculture to train packinghouses and growers to identify microbial risks and adopt the safe handling practices that reduce them. José Oneydo is Cruz Bautista’s quality manager. He has been with the company for 13 years. Oneydo believes his company’s salmonella problem originates on farms and is spread by reusing the bags that carry peppers from the field to the packinghouse. Some of these same bags have been used to carry chicken manure, a major source of salmonella. “Who would have thought that recycling bags would be the source of our problem?” he said. Although farmers have stopped using chicken manure to fertilize their crops, Oneydo has made sure that his suppliers have totally disposed of the bags in favor of reusable plastic crates that are washable. Oneydo now plans to offer periodic health and hygiene refresher courses to farms and packinghouses and to incorporate what he has learned from the program about Good Agricultural Practices and Good Manufacturing Practices. He also encourages growers to install bathrooms on farms that are designed with health and hygiene considerations in mind. Exporta Calidad, together with the agriculture ministry, aims to train nearly 100 packinghouses and about 400 farmers on safe growing and handling practices for peppers. Further, the program has plans for a salmonella testing training program for export produce. Exporters will better understand the economic and health benefits of safe produce and gain the tools to develop their own action plans to improve food handling and safety and ultimately, reclaim the Dominican Republic’s position in the international fruit and vegetable market. As for Cruz Bautista, the company understands it will take time and effort to get off the automatic detention list. They will need to have at least five consecutive clean tests, as determined by an independent tester, to get off the list. The planned salmonella testing program will likely go a long way to instill confidence that they will be able to source safe products and resume exporting as they were.